Governor Andrew M. Cuomo today announced that Downtown Jamaica was selected as the winner of the $10 million Downtown Revitalization Initiative in New York City. The Downtown Revitalization Initiative, first laid out in the Governor’s 2016 State of the State address, marks a comprehensive plan to transform local neighborhoods into vibrant communities where the next generation of New Yorkers will want to live and work. The winner was selected as part of a competitive process by the state’s New York City Regional Economic Development Council and will receive funding to revitalize the local neighborhood and generate new opportunities for long-term growth and prosperity. The $10 million award will include up to $300,000 in planning funds for private sector experts to work with a local planning committee to draft a Strategic Investment Plan that will identify specific economic development, transportation, and housing projects. The grant is part of a $100 million effort to improve the urban vitality of city centers across the state. Plans will be completed by early 2017. Capitalizing on Jamaica’s higher education institutions, cultural cornerstones & diversity, we are transforming it into a magnet for opportunity...to attract private investment & generate economic activity for generations to come. As a vibrant mixed-use community with a central downtown and a multi-modal transit hub, Jamaica, Queens is on the cusp of a renaissance. Downtown Jamaica is experiencing a wave of private and public investments in infrastructure, housing, hospitality, retail and jobs. The DRI will build on existing public and private investments through a comprehensive strategy that will maximize community assets to become an affordable, livable and sustainable mixed-use community for residents, workers and visitors. 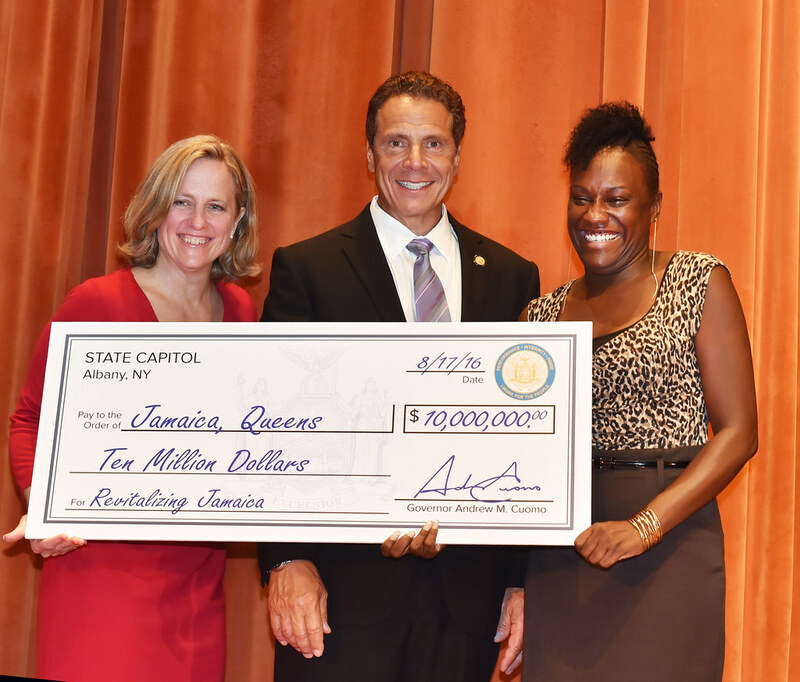 Queens Borough President Melinda Katz said: “Queens lauds Governor Cuomo for his foresight into Downtown Jamaica's future. The Downtown Revitalization Initiative is a program that will impact the trajectory of Jamaica. This generous funding will significantly build upon the community-generated and -driven Jamaica NOW Action Plan currently underway toward the area's smart growth and revitalization. The funds will allow key investments to move forward in infrastructure, housing and retail opportunities, driving new economic growth and creating jobs. A critical component of the Jamaica NOW Action Plan includes our ability to ensure this vibrant neighborhood remains an affordable destination for families – and this investment from the Governor's Regional Economic Development Council will help to do just that. I look forward to our continued partnership in bringing growth and prosperity to Queens."